Reminiscent of the department store window displays of years past, this elaborate Christmas exhibit evokes magical nostalgia. 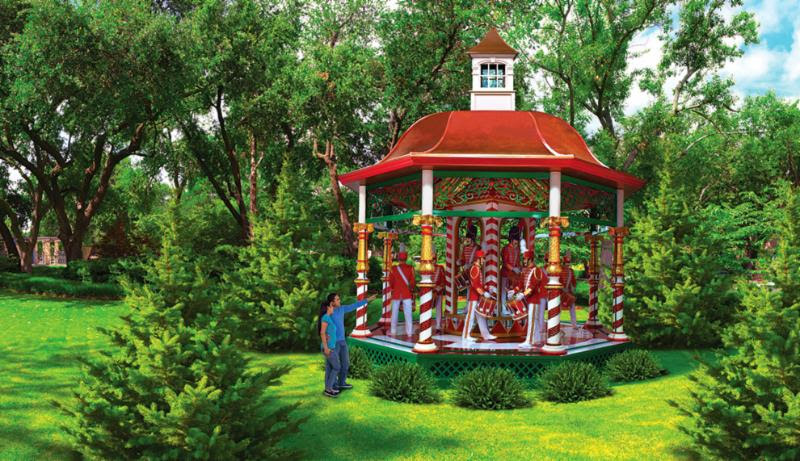 A collection of 12 Victorian gazebos are encased in glass, each filled with moving costumed characters and the festive sounds of the season. Don’t miss this incredible limited time offer to secure $5 tickets to the illuminated nighttime showings of The 12 Days of Christmas. Early Bird Tickets must be purchased before Sept. 1. Sundays-Thursdays | November 16-January 4 | 6-10 p.m.
Special Weekend Nights | November 28 & 29 | December 26 & 27 | January 2-4 | 6-10 p.m. The last symposium for the summer will be Tuesday, August 12th, at 6:00 p.m. in the Cafetorium at the old Sunnyvale Elementary School, 416 Tripp. The program will start with potluck dinner and fellowship at 6:00 p.m. After the meal, you can start on your craft. There are lots of glassware left over from the June symposium, so we will make glass plate flowers and totems again. Make several for your yard or porch. They make great gifts too!! Also, there are some wine bottles that have drilled holes (for lights). If you want to decorate a wine bottle with colored gems, you can do that, too. All the supplies you need will be provided, so come, get creative and bring a friend!! !